Magic Spanish for Kids is an award-winning audio CD about a magical trip to Mexico. Two friends, Bobby and María, take this journey with a series of conversations and songs designed to introduce children to basic Spanish. This CD by Beth Manners’ Fun French and Spanish is designed for children ages 2-6, but would also be appropriate for older children beginning to learn Spanish. In this story, María does not speak much English and Bobby does not speak much Spanish, so they translate what they hear, checking to see if they have understood. With this premise, the English is repeated in Spanish and the Spanish is repeated in English as a natural part of the story. There are also seven Spanish songs on this CD. These lively, singable songs are in Spanish and woven into the narrative of the story. The lyrics are included in the CD liner. The trip to Mexico provides a loose setting for the narrative, but it is not trying to create enough context to make the language clear. That is done through translation, and children listening will always understand what is happening. Children learning Spanish need to be exposed to as much native-speaker Spanish as possible and a variety of materials can be a huge help to parents and teachers. The Spanish on this CD is clear and is a great way for beginners to listen to the language in an inviting and accessible setting. There is lots of vocabulary on this CD. Magic Spanish for Kids introduces children to common Spanish words like colors, clothes, toys, body parts and the present tense of several verbs. Kids will not remember all of this vocabulary, but these words are going to be repeated in other situations. This CD gives them a good introduction to the sounds of this basic vocabulary. The story also introduces children to the concept of verb conjugation. Kids hear verbs change as Bobby and María talk about what different people will take on the trip (llevar), what they will give (dar) to someone or what they have (tener). Magic Spanish for Kids also encourages children to say some of the most common Spanish words and phrases aloud with the characters. These words are carefully chosen and very manageable. Bobby and María ask kids to say simple practical Spanish phrases like hola, vamos a México, por favor, gracias, a casa. Although this CD is mostly a listening experience, pronouncing these words keeps children engaged and focused on what they are hearing. Kids naturally repeat other Spanish words and phrases they hear. Parents listening with kids should encourage them and model saying the Spanish vocabulary aloud. The magical trip to Mexico naturally introduces children to some basics of Mexican culture. They hear about el mar caribe, beaches, Uxmal, pyramids, and the Mayas. Spanish language is the primary focus of this CD, but these geographic and historical elements promote an early awareness of the richness of Mexican culture. 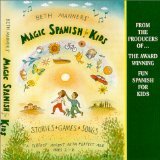 You can listen to sound samples from this Spanish CD for kids on the Beth Manner’s Fun French and Spanish website. You can also read more about their other great products on the site and in this post about Spanish in a Basket. Spanish Friday - ¡Al Perú!